The links among wine, place, and identity are both cultural and agricultural. Local tradition often informs the many decisions made during the growing of grapes (viticulture) and the making of wine (viniculture), but wine also reflects the physical environment in which the grapes are grown—a combination of geology, aspect, and weather that the French call terroir. Thus wine production techniques are (in principle, at least) adapted to local conditions, resulting in wines that can be strongly connected to their particular place in the world. Products made on a small, individualized scale are not very practical in the twenty-first century, and commercial pressures are pushing wine production towards more uniformity and less site-specificity. But there is a greater long-term threat to the traditional connection between wine and place. Climate change, the fruit of the Industrial Revolution and continued population growth, is beginning to make decades of winemaking expertise irrelevant. In an increasingly warm world, the particular associations between wine and place will be difficult or impossible to maintain. This article explores ways in which the changing climate will affect wine production, and how winemakers must adapt in order to continue making wines that reflect their particular region and site. I use simulations of future climate to represent the ways in which weather and climate are likely to change in the coming decades in several wine growing regions; I also describe the reactions of several vintners to the simulations, focusing on the range of responses they are considering. Some wines are so strongly identified with a particular place that they are emblematic, like California Zinfandel or Pinot Noir grown in Burgundy. The link arises because grapes grown in favored sites can express themselves and that place with extraordinary clarity, while the same grapes grown somewhere else may have something else entirely to say, or may be mute. The connection between site and flavor is strongest in Europe, where centuries of experimentation have led to precise ideas about which grape varieties and growing techniques make the most desirable wine in each region. In many locations this knowledge has evolved from tradition into legislation, formalized by authorities called controlled appellation boards. At a minimum, these organizations define the geographic extent of the wine growing area and specify the varieties that may be grown within its borders. The mandates may go further, specifying ripeness levels for harvest or particular viticultural practices. The boards essentially define the regional wine, then tell growers and vintners how to produce bottles as close to this ideal as possible. Appellation regulations are intended to make it easier to fashion wine that suits the physical characteristics of the region, most importantly the local climate and geology. Soil and landscape are virtually immutable on a human time scale (absent some catastrophic event), and the typical year-to-year changes of weather patterns are part of vintners’ collective experience. But the rate of climate change is now faster than it has ever been, and the changes are only expected to become more dramatic. If the local weather changes significantly, the grape varieties and viticultural techniques that have been so carefully refined over time will begin to fail, because weather exerts such a strong influence on the taste of wine. Though decisions in the winery and cellar have some influence, much of a wine’s flavor is determined by the way the grapes taste at harvest. Flavor is determined in part by the geology of the site and by the grape variety, then shaped by the trajectory of ripening, the distribution of sunlight, and the amount of heat and rainfall to which the fruit is exposed over the course of the growing season.1 Ripening begins with veraison, typically forty to sixty days after the fruit sets, when grapes begin to soften, sweeten, and take on color. Over time, sugars accumulate in each berry, the tannins in the seeds and skins mature, acidity levels drop, and secondary flavors develop. Growers ideally harvest when the grapes have reached the peak of physiological ripeness, when sugars and acids are balanced and the other flavoring elements are mature. Ripening is driven by ongoing photosynthesis, which requires warm weather and sunshine. By and large, sugar levels increase as warmth and light accumulate, while the tannins and other flavors require many weeks on the vine to develop. The requirements for ripeness depend on the variety, and different growers may try to obtain different qualities in their grapes. As a general rule, white wine varieties ripen earlier than do grapes used to make red wine, which is why warm viticultural regions like central California and southern Australia are known for rich, alcoholic red wines, and cool climates like Champagne are associated with white wines. Vines also “remember” the weather from one year to the next, since the shoots on which berries form begin to grow the year before the flowers bloom. If the fall weather is poor or if an early frost arrives before the shoots mature, the next season’s growth will begin in a weaker state. Grape development doesn’t depend on what happens on any particular day, but rather on the accumulation of weather over the course of the growing season, such as overall amounts of precipitation and sunshine. To say that a particular variety ripens well in a given location means that in most years the berries eventually mature enough to have good flavor but don’t get so much sun and warmth that their sugar levels become excessive or their acidity falls too much. In any given year, though, the ripeness on a specific day is almost entirely unpredictable. This dichotomy illustrates the difference between weather and climate: climate is weather in all of its variety. Climate includes the likelihood of extreme events like hailstorms or cold snaps, the likely distribution of temperatures, and the complete range of possibilities for every element of the atmosphere that might matter. Weather predictions are accurate in their specifics for a week or ten days at most. Climate prediction, on the other hand, is an exercise in probability rather than certainty. The long-term forecast (measured in decades) is at once vague and robust: the world will almost surely be warmer than today, though it is hard to say by how much, when, and where. Predictions of overall warming can be made with confidence because the fundamental principles causing the change are very well understood. Temperature is a manifestation of energy, and human-induced changes to the atmosphere are affecting the way the earth exchanges energy with the rest of the universe. This transfer of energy is accomplished by light, also called radiant energy or radiation. The planet is bathed in sunlight, some of which is reflected back to space by bright clouds and ice, but most of which is absorbed by the oceans, land, and atmosphere. Energy moves around the earth by warming the land, evaporating water from the ocean, or making the wind blow. Eventually, the energy is transformed into infrared radiation. This invisible light is emitted back toward space, exactly balancing the absorbed sunshine. The atmosphere is transparent to sunlight but doesn’t easily allow infrared radiation to pass through. By slowing the energy’s escape, the atmosphere makes the planet warmer. This has been happening since the earth was formed, and it is, in part, the reason that life is possible here: without the atmosphere’s warming effect, the planet would be an icy ball with a temperature near −20°c (0°f). Only some of the gases that make up the atmosphere absorb infrared radiation; two of the most common are carbon dioxide and water vapor. If the amount of these absorbing (“greenhouse”) gases increases, the atmosphere will become more opaque to infrared radiation, and the planet’s temperature will tend to rise. And of course many human activities, but most of all the burning of fossil fuels, increase the amount of carbon dioxide and other greenhouse gases in the atmosphere. Our actions are changing the composition of the atmosphere in a way that makes the atmosphere trap more energy and pushes the planet towards a warmer state. This much is undeniable. But the internal workings of the climate are so enormously tangled that exact predictions of future climate are uncertain. Climate and weather are influenced by nearly every physical, chemical, and biological system on the planet, and each of these systems varies from place to place. The amount of rainfall in a given location helps determine the kind of vegetation that thrives there, for example, which in turn influences how much sunlight is absorbed. The interactions that are already known are enormously complicated, and it’s certain that others exist that haven’t yet been identified. Like weather prediction, climate simulations (like the ones I use here) are made with huge computer programs that divide the world up into boxes, then keep track of the energy (temperature), water, and momentum (air motion) in each box. This view of the world is blurry, however, since the current limitations of computer power mean that the individual boxes into which the world is divided are fairly large (tens of kilometers across for weather prediction programs, and hundreds for climate models). It’s also crude, because the complicated processes and interactions have to be cartoonishly simplified. Weather services make predictions every day for the coming week or two, a span of time during which many things vary little, if at all (what plants are growing where, how warm the ocean is); climate predictions, in contrast, need to account for changes in almost every one of the earth’s many components. This complexity means that while predictions about global changes are probably broadly accurate, the predictions that matter to individuals—those that describe the changes in specific locations at specific times in the future—are at best a rough guide. Viticulture is in some ways more vulnerable to climate change than other aspects of agriculture, because decisions can take years to play out. Should a winegrower decide to replant a vineyard with a more heat-loving variety, for example, the vines will take three or four years to bear fruit, and at least a decade or more to produce the highest quality grapes. This delay between action and result puts pressure on winegrowers, who must understand the ways in which climate may change in years ahead so that they can think about adaptive strategies. Some winemakers believe that the climate has already changed in the last few decades, and statistics do show a trend toward earlier flowering and harvesting. (In fact, because grapes have been cultivated for so long and so much attention has been paid to them, viticultural records have been used inversely to help reconstruct the climate over the last few hundred years.2) Some contend that warming may have contributed to better wine,3 though this is hard to disentangle from the evolution of vinicultural techniques. The climate of the last decade has almost certainly had an effect on style, making richer, lusher (or at least more alcoholic) wines possible nearly everywhere in the world. What might wines be like in twenty-five years if the climate continues to warm? At that time, many of the people currently running wineries will still be working. These men and women, with their firsthand experience of the traditional wine styles of their regions, will preside over the transition from the older styles that have held sway for tens or hundreds of years, to the wines of the twenty-first century. With this thought in mind, I used simulations4 from a global climate model5 to get rough estimates of how climate may change in several wine producing areas by the year 2025 and then asked winegrowers from each region what changes they might expect in vini- and viticultural practices and in the wines they produced. I assessed climate changes by comparing two twenty-year time periods (1980–1999 and 2015–2034). 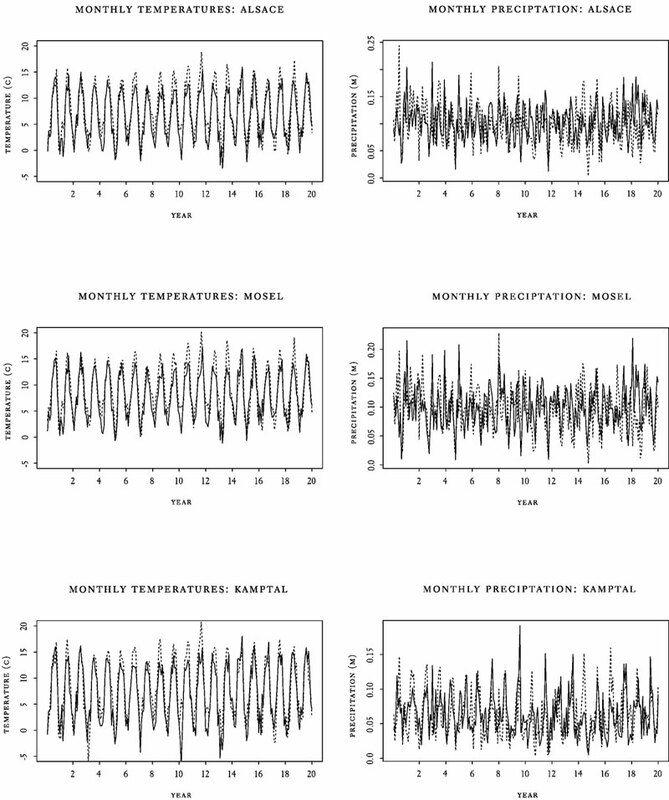 For each year I computed the meteorological quantities most closely tied to wine quality6: total rainfall, surface sunshine, frost dates, and warmth as measured in degree-days7 for each season based on daily values at the model grid point closest to the region. This approach gives a sense of how year-to-year variations may themselves change in the future, as well as of how the average climate might change. Two global predictions are relevant to winemakers: the day-tonight temperature difference is predicted to decrease slightly with time; and there is likely to be a somewhat higher risk of thunderstorms, with the attendant risk of damaging hail. In these discussions, the growing season is inexactly considered to be the spring, summer, and fall of every year. Each season of the year lasts three months; spring begins on March 1. As a general rule, the average changes between the climate projected for 2025 and the current climate are no larger than the range of current year-to-year variations. The following accounts are only the beginning of the story. The geography of wine regions is intensely interesting to both vintners and aficionados because the exact location, slope, and exposure of a particular parcel can dramatically affect the way grapes grow and ripen. Given the coarse resolution of the climate simulations (about 280 km, or 175 miles), the available predictions are only a rough guide to the changes that may actually occur. Furthermore, neighboring winegrowers can hold diametrically opposing views on how to grow their grapes, not to mention how to adapt to climate change. The vineyards of Alsace nestle up against the eastern slope of the Vosges Mountains, running parallel to the Rhine River in the northeast corner of France.8 The mountains create a rain shadow, and the resulting sunny days and mild temperatures allow grapes to ripen at this extreme latitude (of the French wine producing regions, only Champagne is slightly further north). The current climate is just warm enough for wine to be produced in most years, and chapitalization (the addition of extra sugar to increase alcohol levels) is not uncommon. The varieties permitted in the Appellation Controlée are those that favor cool weather, many of which are grown across the river in Germany but not elsewhere in France—Riesling, Gewürztraminer, Muscat, and a little Pinot Noir, the only permissible red variety. Predictions of climate change for twenty-year periods centered on 1990 (solid lines) and 2025 (dotted lines) in three wine-producing regions of Europe. Courtesy of Robert Pincus. • Rain and snowfall may decrease slightly, though they will be more uniform from year to year. Springtime will tend to be drier. Summers will vary more dramatically from year to year than they do today, and falls will generally be more consistent. • Sunshine over the growing season will increase by about 1.5 percent, with most of this change occurring in the summer months. The variations from year to year will be larger, and some years will be much sunnier than they currently are. Fall sunshine will be more variable but spring sunshine more consistent. • Frosts in late spring may become more common, with the last frost occurring one to three weeks later than it now does. The first frost of fall, however, will be delayed by about a month. • There will be about three hundred more degree-days during the growing season than there are today. This is a very small percentage increase, corresponding to an average daily temperature change of about 1.1° c. Most of the change will occur in summer and fall. It’s hard to believe that anyone would seriously try to cultivate anything along the banks of the Mosel. The river’s course through western Germany is so tortuous that one might start facing east, walk following the flow for a kilometer or two, and wind up facing west. The banks are vertiginous slopes of loose sheets of rock, climbing several hundred meters to wooded hilltops at angles of forty-five degrees or more, terrain so convoluted that it gives rise to entire taxonomies of microclimates. But in the warm oxbows, where the slopes face the low sun and the light and warmth are reflected from the river onto the dark slate, some of the finest Riesling in the world is grown. Grapes in the Mosel typically spend long, mild falls on the vine before harvest and so retain enough acidity to balance the apple and citrus fruit flavors and to age magnificently. In exceptional years, some growers may also take the risk of leaving grapes hanging in the vineyards to develop the fungus Botrytis cineria, the “noble rot” that dehydrates the grape, concentrating the juice inside the berries and adding a haunting flavor of honey. Botrytis-affected grapes become the sweet Beerenauslese and rare Trockenbeerenauslese wines. A few vintners make the further gamble of leaving fruit on the vines until December or later, when the hard frosts arrive and the water in the berries begins to freeze, concentrating the sugars within the grape. The fruit (sometimes picked at night) is pressed frozen to become intensely sweet Eiswein (ice wine). • Precipitation will decrease by about 5 percent on average. Drier falls will become more common, although the wettest winters will be much wetter than today’s. • Sunshine over the growing season will increase by about 1.5 percent, though this will be more variable from year to year than it is now. Summers, in particular, are likely to be sunnier than today. Extremely sunny or cloudy years will become somewhat more frequent, though still rare. • There will be about three hundred more degree-days during the growing season. Spring and summer will be uniformly warmer, and fall somewhat warmer but more variable than today. • Frosts of −7°c (hard enough to make Eiswein) will arrive about a week later than they do now, but they will arrive in about 25 percent fewer years. To Johannes Selbach of Selbach-Oster and J.H. Selbach in Zeltingen these predictions sound as much like history as a possible future. “It was the rule that in a decade you would have a couple of bad vintages [when grapes didn’t ripen sufficiently] and a couple of great ones. Since 1988 every year has been good to outstanding,” he explains.11 Warmer weather in the past has been a boon for the Mosel, which is “on the brink of viticulture,” and further warming in coming decades will allow Selbach to produce richer, riper wines. German law mandates ripeness levels for various designations of wine; warmer weather would allow Selbach to “put more meat on the bones of every category,” as he has begun to do in recent years. The greatest threat from the changing climate has nothing to do with grapes. “If the Mosel floods,” Selbach points out, “we sit in the water.” The valley is so narrow that villages lie right next to the river, and the mountains come down steeply to the shore. Like many of his colleagues, Selbach’s cellar is in the basement of his home. “If all your money sits under water, it’s a bad feeling.” Flooding has become more frequent in recent years, a trend that is likely to continue as the winters become wetter. Selbach and others of his generation think it inevitable that they’ll have to move from their homes, some of which are hundreds of years old, to higher ground. To read an Austrian wine label is to get a crash course in a whole new vocabulary of varieties grown nowhere else in the world—Blaufränkisch, Zweigelt, Sankt-Laurent. Wine is produced throughout eastern Austria, near the borders with Slovenia, Hungary, Slovakia, and the Czech Republic. Some of the loveliest Austrian wine is produced in the regions along the Danube—the Wachau, Kamptal, and Kremstal. In Austria, which is substantially further south than Alsace or Germany, it is much easier to ripen grapes fully, so the wines tend to be richer and fuller than their northern counterparts. Austria’s vinous heart is Grüner Veltliner, a white variety with structure, mineral content, and complexity, which pairs almost flawlessly with food, especially legumes and vegetables. Grüner Veltliner is a picky grape, requiring fastidious geology and just the right combination of warm days to mature and cool nights to stay fresh, and it thrives in Austria as in no other place on earth. • Rain and snowfall may increase by about 10 percent on average, with most of this precipitation occurring in spring. Summer rainfall may tend to cluster, so that a given summer will be either rainy or dry, but not enormously different than today’s summers in regard to precipitation. • Sunshine over the growing season will increase by about 2 percent, though this will vary from year to year. Summers, in particular, are likely to be sunnier than they are today. Extremely sunny or cloudy years will become somewhat more frequent, though they will still be rare. • Growing season degree-days will increase by about two hundred and fifty (i.e., the average daily temperature will increase by about 1°c). Fall, in particular, will be warmer, as will summer, though to a lesser extent. Summers will also be more variable: years are more likely to be either cool (and cloudy) or hot (and sunny) but not as moderate as today. Like Johannes Selbach, Willi Bründlmayer of Weingut Bründlmayer in Langenlois is not surprised by the predictions. “We appreciate by now that a climatic change has already taken place. Our wines are getting more body and less acidity [and growers are] beginning to plant red wines.”12 But because grapes in the Kamptal already receive enough sun and warmth to ripen, Bründlmayer is concerned that more insolation and higher temperatures will push some of the vines too far. “We will drop out of optimum position for Grüner Veltliner,” he says bluntly. And although Chardonnay is a more adaptable variety than Grüner Veltliner and is already grown with great success in Austria, Bründlmayer wants to keep producing something more distinctive. “The advantage of Zweigelt or Sankt-Laurent is that they’re something new in the world,” he explains. These are, in other words, the varieties that distinguish Austrian wine from all others, and Bründlmayer is devoted to the special qualities of what he grows. “If this forecast were 99 percent sure,” he says, “I would pursue with vigor new sites for planting Grüner Veltliner. I would find new vineyards for the new situation.” But the decision is not his alone to make. European Union regulations don’t permit a net increase in any country’s vineyard area, so new, exploratory plantings would have to come at the expense of existing sites. Adjustments at this scale would involve the whole Kamptal, or perhaps all of Austria. For Bründlmayer, climate change “puts the complete system of Appellation Controlée into question.” Ten years ago, in an action steeped in tradition, he helped found a small group13 devoted to finding the best matches among soil, rootstock, and varieties in the Kamptal and neighboring Kremstal appellations. More recently, though, he has begun to believe that “if the future climate [proves] to be fluctuating and uncertain, a long-term fixed relation of vineyard site, rootstock, and variety may not be sensible, [and] a more dynamic approach might be reasonable.” The group had already begun discussing these ideas when Europe was unexpectedly drenched by torrential rains in the summer of 2002, which caused one-hundred-year floods along the Danube and inundated several winery cellars in the Kamptal and nearby Wachau. They were forced to turn in a moment from patient investigation to the very short-term, pragmatic question of how to help the growers devastated by the waters. Although the summer’s dramatic weather can’t definitively be attributed to human activities or climate change, extreme events (like droughts and floods) that were previously rare have become more frequent almost everywhere on the planet. One could say that we experience weather, as we feel the heat of the day or find that the winter has been especially wet. But we do not experience climate, which occurs on a time scale longer than we can really perceive. Yet climate inexorably affects the way that we live. It’s almost certain that the climate will change over the next several decades, and wine producers, like everyone else, will have to adapt. Some will try to use their skill and experience to continue making wines in the traditional style of their region. In colder regions, where ripe grapes and great vintages have historically been rare, their jobs may become a little less stressful. Some adaptations will involve choices made by individuals, such as changes in vineyard management or the replacement of one grape variety for another; others will require more far-reaching changes, including cooperation with governing bodies and appellation boards. But where the culture of wine production is tightly coupled to the current climate, something will have to give. What is certain to change as a result of adaptation are the links between particular wines and their traditional home. Ice wine, though rare even in Germany, is one of the purest expressions of that chilly climate, a vinicultural turning of lemons into lemonade. Grüner Veltliner is Austria’s beloved treasure. Yet both of these wines will likely be much more difficult to produce in the coming decades than they currently are. Even where the impact of climatic change is less dramatic, decades, even centuries, of vinicultural experience will be rendered irrelevant. I appreciate helpful conversations with wine producers Willi Bründlmayer (Weingut Bründlmayer, Langenlois, Austria); Randall Grahm (Bonny Doon, Santa Cruz, us); Jean Hugel (Hugel & Fils, Riquewihr, France); Michael Moosbugger (Schloss Gobelsburg, Langenlois, Austria); Johannes Selbach (Selbach-Oster, Zeltingen, Germany). 1. See, for example, D. Jackson and D. Schuster, The Production of Grapes and Wine in Cool Climates (Aotearoa, New Zealand: Lincoln University Press, 1997). 2. See, for example, C. Pfister, “Monthly temperature and precipitation in central Europe 1525–1979: quantifying documentary evidence on weather and its effects,” in Climate since a.d.1500, edited by Raymond S. Bradley and Philip D. Jones (New York: Routledge, 1992), 118–142. 3. R.R. Nemani, M.A. White, D.R. Cayan, G.V. Jones, S.W. Running, and J.C. Coughlan, “Asymmetric climatic warming over coastal California and its impact on the premium wine industry,” Climate Res. 19 (2001): 25–34. 4. The simulations were made by the National Center for Atmospheric Research (ncar) as a contribution to the Intergovernmental Panel on Climate Change’s Third Assessment. In this study I’ve used the calculations for Scenario A, “Business as usual,” in which greenhouse gases increase with time. The atmosphere, ocean, and land surface all interact with each other. The scenarios are described in Climate Change 2001: The Scientific Basis (Cambridge: Cambridge University Press, 2001). 5. The NCAR climate model is described in M. Blackmon and twenty-five coauthors, “The Community Climate System Model,” Bull. Amer. Meteor. Soc. 82 (2001): 2357–2376. 6. A more complete treatment of this idea applied to a single region can be found in G.V. Jones and R.E. Davis, “Using a synoptic climatological approach to understand climate-viticulture relationships,” Int. J. Climatol. 20 (2000): 813–837. 7. Because vines begin to grow at temperatures above about 10°c, each day warmer than this base temperature contributes the temperature excess to the total degree-days (i.e. five days of 15°c temperatures contribute twenty-five degree-days to the total). 8. A useful source on the geography of viticultural regions worldwide is Oz Clarke’s Wine Atlas (London: Websters International Publishers, 1995). 9. Telephone interviews with Jean Hugel on 21 November and 27 November 2001. 10. M. Boesch, 800 ans de viticulture en Haute-Alsace (Guebiller: Privately published, printed at L’imprimerie Art’real, 1983). 11. Telephone interview with Johannes Selbach on 22 November 2001 and ongoing correspondence. 12. Telephone interview with Willi Bründlmayer on 26 November 2001 and ongoing correspondence. 13. The group Traditionsweingüter maintains a Web site (in German) at www.traditionsweingüter.at.